In a bowl, whisk together the Strawberry Balsamic Vinegar and honey. Slowly add the Extra Virgin Olive Oil in a slow, steady stream and continue whisking to emulsify. Add salt and pepper to taste, and set aside. Core the lettuce and cut it into quarters through where the core was. Place a wedge on each of the chilled salad plates. Top each lettuce wedge with chopped strawberries, crumbled bacon, chopped green onion, crumbled feta, and chopped pecans. 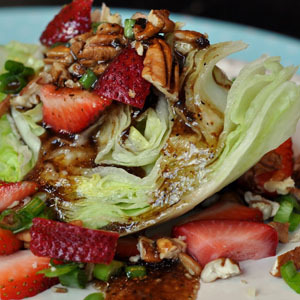 Drizzle the Strawberry Honey Balsamic Vinaigrette over each wedge and serve.